Years ago when my Sister, Linda, was working at Sears in Medford, they had a big Poo Bear in one of the displays. Later they had a drawing for it and my Sister brought him home!! He got lots of loving from my kiddies thru the years. 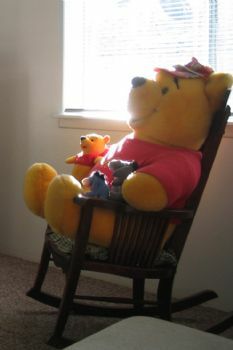 Here is a picture of him and his buddies in a rocker when she was living in Brookings. Her dream had always been to live on the Oregon coast - and she did for about 7 years. And just loved it. l had a Rupert Bear, my little brother 'operated' on him with a tool kit he'd been given, mam tried to put him back together but he was never the same! My daughter got Fred when she was 12. She is 40, and Fred goes with her on every trip, and her kids love him! I love the Oregon Coast!